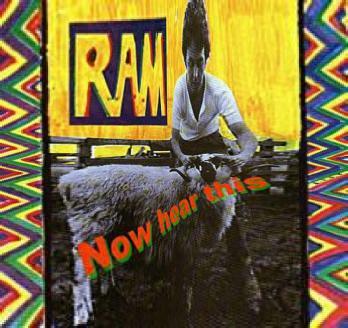 This page is exploring something kind of rare - a bunch of fifteen promo spots for Paul McCartney's second album "Ram". Each of these is only thirty seconds long, but they are all different! The elements are sometimes the same, but they are in a different order any time. The 15 tracks, all with the name of "Now Hear This", were released in May 1971 on a DJ-only disc. It had the name of "Brung To Ewe By Hal Smith". The label was "Apple" (of course) and the order number was "6210". The latest release of all of the promos (together with some other stuff) was in 2000 as bonus tracks on the Bootleg with the original Mono-Mix of Ram (Manural Apple MAS-3375). - Talk "Anyway we didn't get a lift..."
- Talk: "It's entitled "Ram! Ram! Ram! ...a Boogie!" - Ends with music "Eat At Home"